Cynthia Lahti creates artworks that are visually alluring and beautiful, despite their overt imperfections and sometimes-humble materials. Inspired by objects and images, both historical and contemporary, her creations reflect her belief that even the smallest artifact can evoke the most powerful feelings. I have never designed a stamp. I looked for a collage that had larger recognizable images that would reduce and divide well. My art encompasses collage, drawing, and ceramic sculpture. It is influenced by human artifacts from ancient times to the present, as well as by my personal experiences and emotions. For this stamp edition I selected from my portfolio of past collages. The piece I chose is titled Blond Clown, created in 2015. The source images include old magazines and books combined with images I have found, downloaded and printed of objects that are for sale on E-bay. At the heart of these works is the potential of each source image to evoke a different emotional response on a full spectrum of tensions and resonances, which is deepened when two images are collaged together. 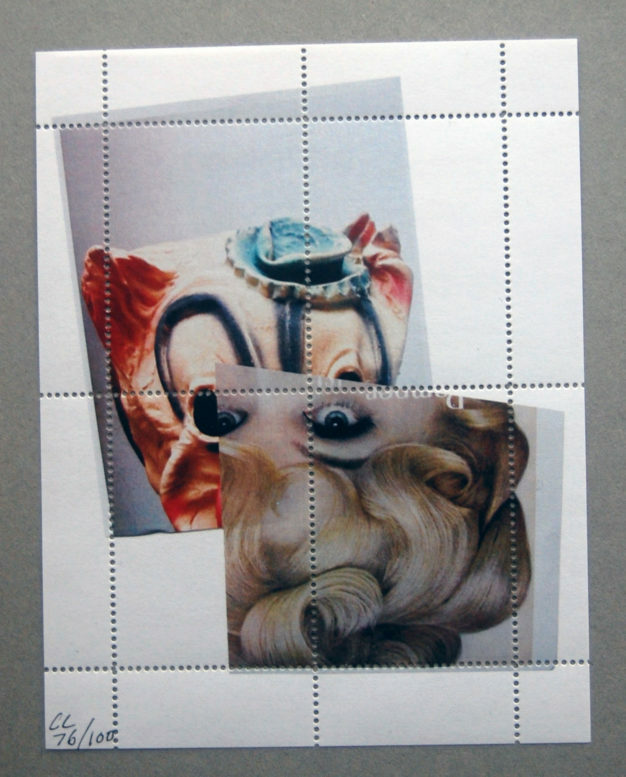 I enjoyed creating a stamp from one of my collages thus transforming it into a new object in the world.